I love these vegan bean burgers. They're packed full of flavor from fresh herbs and spices. My friend Ryan made these for our New Year's party and I had to have the recipe. They might not look too pretty, but they are super tasty. You really can't go wrong with these. Heat coconut oil over medium heat. Add the onion, curry, cumin and stir. Cook until the onion is translucent, then add the garlic. Cook for a few more minutes, and remove from heat. Put the contents along with juice from one lime into a blender (or food processor). Pulse until smooth. Then add the remaining ingredients (except the coconut oil). Blend until the mixture resembles a thick paste. Scoop small patties (about 2-3 tbsp each) with your hands. Roll through additional chickpea flour, if they're too wet. Heat the coconut oil over medium heat, then add a burger, cooking a few minutes on each side. Repeat until all are cooked. If you want them a little crisper, bake in the oven for 10 minutes at 350 degrees. 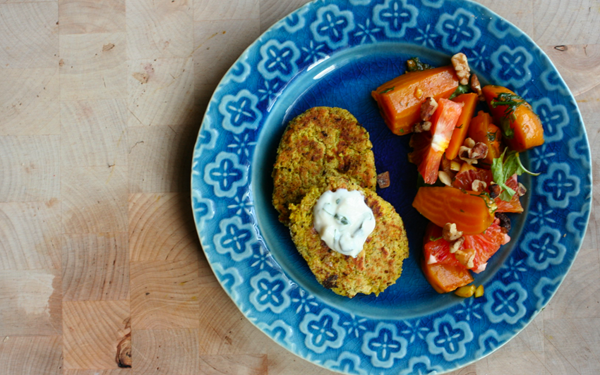 This recipe should make about 12 chickpea burgers. Preheat the oven to 350. Wrap the beets in foil and bake until tender. After 30 minutes or so, remove from oven and let cool. Mix the vinegars and shallot together in a small bowl. Peel the beets and cut into wedges. Slice the orange and add to the beets. Add the herbs to the vinegar and whisk in the olive oil. Pour mixture over the beets and orange. Garnish with chopped walnuts. The sweetness of the beets pairs nicely with the sourness of the orange. Avocado slices would be a delicious addition. Enjoy! 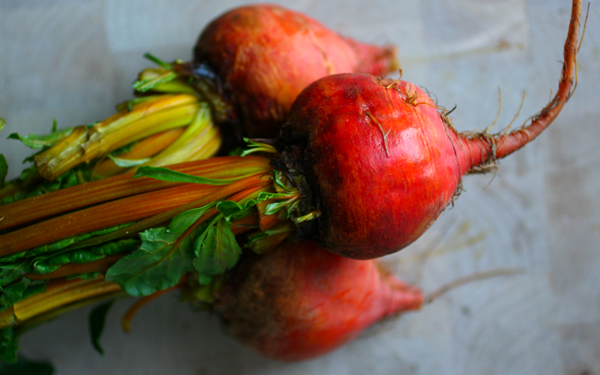 Beets - "love 'em or hate 'em": my husband hates them and I love them. We got an abundance of beets from our food share this summer, so I boiled, peeled, cubed and froze them. Too much of a good thing to consume all at once - or waste. We add a few pieces to our fruit smoothie in the morning where they work their magic amongst the banana and berry flavours. I love the idea of beets in a smoothie. I'll have to give that a try! Yum. You can actually use beat juice as a alternative to food coloring.